Volunteer Fire: Where is it headed? | March 29, 2012 | Comments Off on Volunteer Fire: Where is it headed? Of the 1.1 million firefighters in the U.S., roughly 70% are Volunteers! Knowing the stresses and challenges of being a firefighter, it’s remarkable to see this many people selflessly serving their communities across our great country!! Unfortunately though, the great recession has been causing the number (and the percentage) of Volunteer Firefighters to decline in the last few years. Some of these Volunteers have needed to pick up paid work opportunities like overtime and a second job. The great recession has also brought a tightening to the budget capacities of many municipalities, states and even federal funding grants. As a result, more pressure is being put on the remaining Volunteers along with their aging firefighter gear. Obviously the hope is that as our economy expands again, we’ll also see our rank of Volunteers grow and their local Fire Departments will be able to modernize their fire fighting equipment stock. | March 27, 2012 | Comments Off on OSHA Alliance Program Renewed! The Alliance Program was recently renewed between OSHA and the Society for Chemical Hazard Communication (SCHC). Their continued goal is to ensure workers are aware of the chemical hazards they may be exposed to at the workplace, while also reducing the number of chemical-related injuries and illnesses and to increase awareness of the Globally Harmonized System of Classification and Labeling of Chemicals (GHS). Increasing employee access to effective chemical protective clothing and other personal safety supplies. Develop and employee training program for future hires. Some of the groups OSHA works with include unions, consulates, trade or professional organizations, faith- and community-based organizations, businesses and educational institutes. OSHA also says that through the use of Webinars, industry meetings and national safety and health conferences, the Alliance program will share the best practices and procedures for protecting workers from the hazards of chemical exposure. Utilizing this program is a great way to identify which chemical hazards are present in your workplace and which personal safety supplies are right for you. 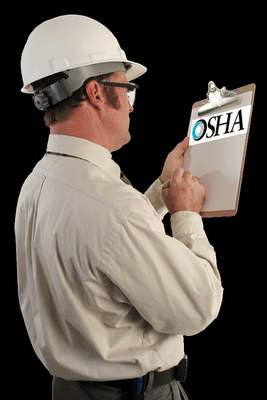 Did you know you have access to a Free Consultation Program offered by OSHA? Well, you do! And many have taken advantage – the OSHA On-site Consultation Program made over 30,000 visits to small business worksites in FY 2010. What happens is a consultant evaluates your workplace conditions, practices, potential hazards, job safety and health programs. Then the consultant recommends what can and should be done to improve your safety and health systems, which may include an updating of the safety supplies you provide your workers. OSHA also says taking these suggestions to the level of participating in SHARP (their Safety and Health Achievement Recognition Program) may result in being exempt from certain OSHA programmed inspections for one year. This can be a great way to re-examine your safety supplies plan, job safety standards and employee health systems! Top 5 MOST Stressful Jobs of 2012! | March 22, 2012 | Comments Off on Top 5 MOST Stressful Jobs of 2012! The most Stressful Jobs of 2012 are in Public Safety. A career placement company, CareerCast, recently ranked the most stressful jobs of 2012. They used factors like Competitiveness, Physical demands, Hazards encountered, Own life at risk, Lives of others at risk and more. 4 of the 5 most stressful jobs are in Public Safety. Clearly our US Military, Firefighters and Police Officers stand out as our nations heroes!! They deal with extraordinary demands and hazardous environments. They protect the lives of so many!! And if their jobs weren’t enough, the budget cuts of recent years just adds to the stress. This means that they cannot purchase the safety supplies and equipment that they most desperately need. We, the public, should be protecting our heroes and making sure they have all the resources they need … to serve and protect us!! High Five is a provider of disposable gloves and non-woven apparel. Barrier Safe and High Five now comprise several product lines including latex, nitrile and vinyl gloves, along with many other supplies for Fire, Police and EMT Services. Enviro Safety Products is happy to be a supplier of fine products like disposable gloves for the fire, police and EMT communities. 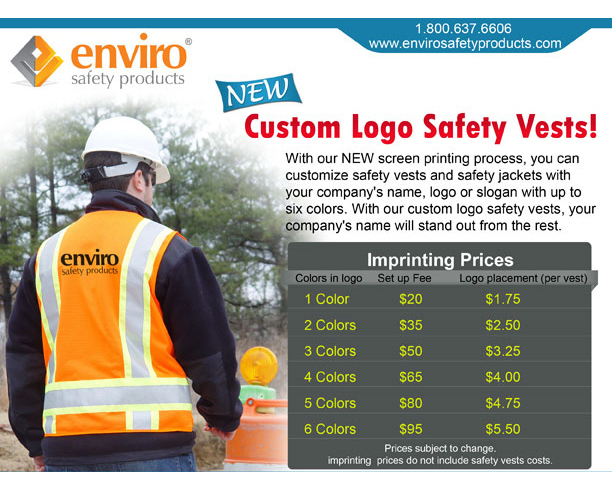 Enviro Safety introduces its NEW Custom Logo Safety Vests program where companies have the ability to get their name, logo and/or company slogan screen printed on the front or back of hi-viz safety vests. Companies all over the country are having their name and logo screen printed on high visibility safety vests and it’s a great way to advertise your company’s name. Stand out from the rest and have us screen print your safety vests today! Browse our wide selection of safety vests available to have your custom logo imprinted on. 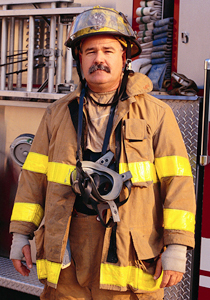 Enviro Safety Products is dedicated to providing first responders and law enforcement with the best respirators that provide the highest level of respiratory protection during biological and natural disasters. We carry a wide selection of full face respirator units and Powered Air Purifying Respirators (PAPRs) that are Chemical Biological Radiological Nuclear (CBRN) certified. With these configurations, your respirator will be NIOSH approved for CBRN requirements. 3M 7800B Full Facepiece Respirator, 3M FR-15 Canister – the 3M 7800B features a low-profile design with a butyl rubber face seal that protects against a wide range of chemical agents. Our most popular mask, this respirator also comes with an ANSI Z87+ faceshield. 3M FR-M40B Full Facepiece Respirator, 3M FR-15 Canister – used by military personnel as-well-as first responders and law enforcement, the 3M FR-M40B features dual ocular lenses that allow users to wear eye glasses simultaneously. This respirator also features an integrated drinking device that allows you to connect your hydration system to your mask. 3M Breathe Easy PAPR System – this all-in-one PAPR system features a one-size-fits-all butyl rubber hood with large viewing window, turbo blower motor two 3M RBE-57 cartridges, breathing tube and battery. This PAPR system offers the best CBRN protection and is used by homeland security, first responders, military personnel and law enforcement. We also carry a full line of replacement parts including breathing tubes, communication devices, batteries, drinking tubes and airflow indicators and 3M cartridges and canisters for the 3M First Responder Respirators and PAPR Systems including; 7800B, FR-M40, FR-M40B, RBE-LV and RBE-L10.